Ann, left, is a volunteer at the Levin Budget Service (Inc) and helps out at reception. Not all volunteers are budget advisors. After Christmas financial fall out can push families past the point of being able to cope with all their financial commitments. 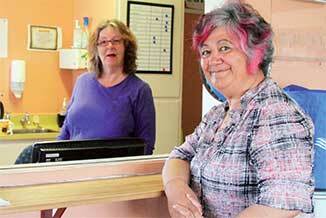 The New Zealand Federation of Family Budgeting Services (Inc) have offices throughout Kapiti and Horowhenua offering absolutely free service to anyone who needs their help. They are committed to providing confidential one on one service covering much more than budgeting. A trained budget advisor can talk to creditors on their client’s behalf, provide advocacy support, and work with other agencies. Levin Budget Service coordinator Margaret Edwards-Graham has had involvement through the Service for more than 15 years. If you have an interest in helping others, you may want to consider training as a budget advisor. In fact some clients have gone on to become trained advisors having lived the talk. Courses are held regularly throughout the year, there is no charge and plenty of support both during and after you qualify. There are a number of Budget services throughout Kapiti and Horowhenua. Electra owns and operates the electricity network throughout Kapiti and Horowhenua. Our owner is the Electra Trust. Electra’s Trust ownership ensures that we deliver an annual electricity sales discount to all consumers connected to our network.